XAN 215 FISCHER Common Process for Testing Cost-effective entry-level X-Ray Fluorescence Measuring Instrument for fast and non-destructive Analysis and Coating Thickness Measurement of Gold and Silver Alloys The FISCHERSCOPE X-RAY XAN 215 is the cost-effective entry-level X-ray fluorescence measuring instrument for non-destructive analysis of jewelry, coins and precious metals. It is particularly suited for the analysis of precious metals and their alloys in composition and coating thickness. Up to 24 elements in the range of Chlorine (17) to Uranium (92) can be determined simultaneously. Typical fields of application are the analysis of: • Jewelry, precious metals and dental alloys • Yellow and white gold • Platinum and silver • Rhodium • Alloys and coatings • Multi layer coatings Outstanding accuracy and long-term stability are characteristics of all FISCHERSCOPE X-RAY systems. The necessity of recalibration is dramatically reduced, saving time and effort. The modern silicon PIN detector achieves high accuracy and good detection sensitivity. The fundamental parameter method by FISCHER allows for the analysis of solid and liquid specimens as well as coating systems without calibration. Features: Excellent precision in analysis and coating thickness measurementReduces the requirements of recalibration thus saving time and effortEquipped with PIN detector for high accuracyOptimum detection sensitivity Application Areas: Jewellery, dental alloys and precious metalsPlatinum and silverRhodiumYellow and white goldMulti layer coatingsAlloys and coatings .. The FISCHERSCOPE X-RAY XAN 215 is the cost-effective entry-level X-ray fluorescence measuring instrument for non-destructive analysis of jewelry, coins and precious metals. It is particularly suited for the analysis of precious metals and their alloys in composition and coating thickness. Up to 24 elements in the range of Chlorine (17) to Uranium (92) can be determined simultaneously. Outstanding accuracy and long-term stability are characteristics of all FISCHERSCOPE X-RAY systems. The necessity of recalibration is dramatically reduced, saving time and effort. The modern silicon PIN detector achieves high accuracy and good detection sensitivity. 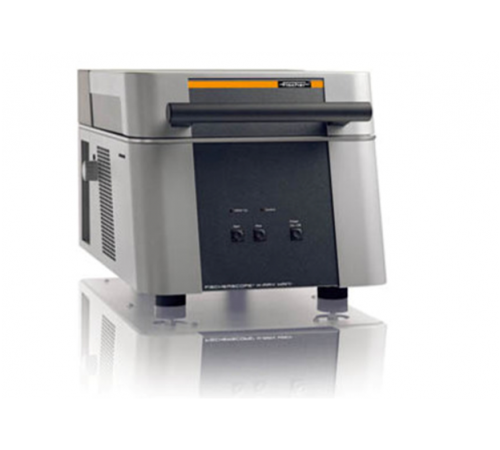 The fundamental parameter method by FISCHER allows for the analysis of solid and liquid specimens as well as coating systems without calibration.